Thank you so much - I know our sweet babies have definitely gotten together by now...I love to think of them having a great time together up there! Your Mom is amazing - still working at 82 years - what a strong lady she is - her outlook is good - for what else can we do really but "..just keep going" - other than giving up - which our babies wouldn't want. I am doing my best Elise, to let go of my disappointment at my family's lack of understanding, I'm trying to realize that they just can't know how totally devastated I am over Lee Lee's loss - to me, she was not "just a dog", she was not "a friend" (even though she was my friend)--- she was my child in every way, my little baby, my very heart ...every ounce of maternal instinct I had, I poured out on her. I am not going to "get over it", I am not having "...a midlife crisis" - I am grieving my heart out for my angel. It is my fault, I guess I just expected too much. I am very grateful for Moms here who understand (like you) and I am so glad that you have your sister - what a blessing for you. Your explanation(in your letter to Bedomom) of why God doesn't let our angels come back to us is spot on I think. I believe that is why we "see" them for fleeting moments in signs and other little creatures - like butterflies or in visits from other dogs. We would probably freak totally out if we saw them the way we knew them and it would just be our undoing to have to part with them twice. You are also right I think in what you said about the signs - they wouldn't be as special if we didn't have to wait for them. Wonderful thoughts - Thank you! I just now read your sweet message from Sunday. Your mother sounds just amazing. Please tell her I said so. I hope that you do get to go by for Christmas even if for such a short while. Time sure flies by even though I feel like none has past. It really does feel like only yesterday that I too was holding my sweet girl, kissing her, loving her, saying my goodbyes, and crying uncontrollably with her. I still don't know what got me through that Thursday at 2:26 pm. I'm sure it was probably mostly my body, heart, and soul in shock or denial? Those words are so very true. I really believe and feel I will never be the same, old Jamie is gone. I am happy for Patches and all of our babies. I really know their happy and in a beautiful paradise. It's just that I miss her and don't want to be here without her in my everyday. I just realized Christmas Eve the 24th will be 2 months my sweet angel isn't here. How heartbreaking. I love her Elise, just as you do your sweetness. Thinking of you and Buddy, the Sweetness. *** I also had my cute little mommy voices only for My One. Yes, when it comes right down to it, mom is remarkable. She has trouble walking - her feet are somewhat deformed from arthritis, but other than that, she does quite well. I am glad that she is a social person - it helps her a lot, and also a big reason why she wants to continue with her job at the library for as long as she can. I know you are trying your best, to let go of the disappointment regarding your family's inability to truly understand how you are feeling, not comprehending the depth of your loss. Lee Lee absolutely was, and always will be your child, your sweet baby who you will always cherish with every fiber of your being. This is the nature of your connection, the depth of your love for her is bottomless and surpasses all human understanding. It is not your fault...it is hard not to have at least a few small expectations of those people in our lives, who are supposed to know us the best, and love and accept us with understanding and open hearts. Holding sweet memories and thoughts of our babies close, on this cold winter's night. Thank you Sweet Elise for your kind, understanding words. It is so good to know that we are not alone in our grief (I did for a long time) - and that others do, sadly, completely "get it". I hope that I didn't give the impression that my family didn't care for Lee Lee, they did love her and she loved them - it was just not a Mama's love. You speak of your grief as as drowning - a very fitting description - it really does feel sometimes like fighting to keep you head above water and getting dragged right back down again. I think of you and your Sweetness often - I know you miss his comforting presence in your life and love him beyond words. Stay warm tonight and send my greetings to your Mom, she is an inspiration. Thank you so much, I will let mom know of your lovely compliment - I know it will lift her spirits. I am heading to my mom's either this Sunday or Monday, for an extended visit. I think I mentioned somewhere, that I just feel like running away from home anymore, and going to mom's is the one place I feel a little better, it certainly isn't here right now, even though my Buds absolutely loved it here. This was the only place we ever lived, where he did not want to leave...he never wanted to go anywhere, just stay here in and around this peaceful house in the woods on a beautiful lake. This place was so meant for him, and yet he had less than a year to enjoy it. It just breaks my heart so much, to look out in this yard and not see his paw prints...not see his snow angels, not see remnants of his chewed up sticks. It's just all so completely wrong...it wasn't supposed to happen like this. How do we survive this? I guess by coming here, writing our hearts out, reaching out to help as much as we can, the other hurting souls here, who are equally devastated, crying our eyes out, trying to hold onto what we had...I don't know. I know what you mean, about trying to go to yoga again, but being afraid of breaking down in class. I had a 'meet and greet' for this new yoga class, starting in mid January, and on the form the instructors were asking what we wanted to get out of the class. The first thing I wrote, out of three choices, was transforming this grief and loss of Buds and the traumatic experiences that surrounded his illness and passing, reconciling it, as I morph into whoever the person is, that I am to become. As you said, the old Jamie is gone...she won't be back and we can only work toward a new goal, of recreating ourselves, with our babies integrated into everything we do, from now on. As Fionasmum wrote so beautifully and eloquently, in a post for Molly's mom earlier today (to paraphrase), every smile, every kindness, every act of goodness we do for the rest of our lives, will contain a piece of our beloved children. We can do nothing from this day forward, that does not include them. Anyway, getting back to the 'meet and greet' - when this very kind woman was explaining about why some people come to yoga, to lower anxiety, learn deep breathing and meditation, help with depression...she asked if any of these pertained to me? Well, I don't know why but I opened up to her, sharing about how it was almost 3 months since losing Buds, and that I was still grieving deeply, had regrets that I was still being tortured by...and then I just started bawling and pouring my heart out to a perfect, although very kind and understanding stranger. I told her much about our special bond, how we became so close and inseparable...she definitely got more than she bargained for, asking that question, but she was very gracious and a wonderful listener and it did feel good, to just let some of this out today. So like you, I will probably cry away during the yoga classes, but you know...that's OK...I'm just going to be myself and if the tears come, they come. I know what you mean Jamie, when you talk about time flying and yet it seems to stand still at the same time. I know how much you miss your sweet baby girl - I am so sorry that the 24th is going to be the 2 month mark of utter and total sadness and loss for you. Like you, I know that our babies truly are happy, and at home now...but also like you, I miss so very much the every day closeness and togetherness that can never be replaced. I understand your wondering, how in the world you ever got through 'that day' or 'that moment'...I can barely stand to think of it, and yet it comes back to haunt me when I want to do nothing more than drive it away, back it into some forgotten corner of my mind where it will gather dust for eternity. I wish now, that I had spent more time holding Buds that morning...I was in the back seat with him on the way to the hospital, crying all over him and caressing him...then they carried him in, and then we were in a room together for awhile but I cannot remember much it's a blur now, I do remember that I was kissing him all over, holding him and then felt selfish because I knew he wasn't well, and just wanted to go. Then, the horrible feeling of just abandoning him to that place afterward, after he slipped away...honestly I think it would have been easier to have been run over by a truck, than to endure this. I knew he was failing, and so wanted him to be able to pass at home here, where he loved it so much but he would have been suffering by then, and as it was Sunday there was no vet that would come that day. You are very welcome - I am so sorry that you went on for a long time, not having this support and understanding from as you say, a sad community of grievers who definitely do 'get it'. I didn't think you did give the impression, that your family didn't care about Lee Lee or love her, just that they could not understand completely, why you are in the state you are in because you are her Sweet Mama. Three things right now, are keeping me going. The first is the knowledge that we will be reunited with our babies, and that they are happy and free and waiting for us, wrapped in God's love. The second is the blessing that this community of caring friends has become and the third is my loving family and a few friends outside of this forum. There was a song that was playing in the cassette player at the time, by a group that was called "Lake". I don't remember the exact name of the song, but I remember the last phrase of the song, that I heard, before the cassette player shut off, and they were "Jesus came down, and love shone around"...then we found ourselves in the ditch, on the other side of the road, the whole front of the car was crushed. If we had been in a smaller car, I would not be writing this today. It was such a strange feeling, what happened after that...I knew we were in shock, the only reason my boyfriend didn't go through the windshield was because he had been in previous car accidents, and did a shoulder block into the dashboard, as he saw it coming in time to do that. I didn't go through it either, because I was driving, and held onto the steering wheel and absorbed the impact that way. But somehow, my leg just below my left knee received a serious laceration, that I wasn't aware of, right away. People started coming around, and eventually someone called an ambulance. I just remember being so calm and at peace, while waiting for the ambulance that day. Calm, thinking about the message from God through that song - thanking God so much for sparing us and praying for the people in the other car. Luckily, no one was killed or maimed for life, out of this accident. People came from neighboring houses, telling us to get out of the car, but I refused as for some reason, was able to think logically, that if I did leave the car, I might do permanent damage to myself, if my spine had been injured. All to say, that God opened my eyes that day, to His presence and Love, and the fact that our lives our very fragile...we hang here by a thread, by the grace of God go we. It was the most humbling experience of my life, but I knew without any doubt, that God was with us, and that there were many lessons and blessings that were granted, that arose from this terrible 'tragedy'. There were quite a few signs from Above that fateful day, wouldn't you agree? And, on Easter Sunday of all days...the day of Life and Resurrection? Sometimes, the signs we receive...the messages, are very definite...and this one, was hard to miss! Strange how this all came out in this post to you Melanie - I didn't sit down, planning to write this testimonial. But it did tie into the thought, that we are blessed, even through tragic circumstances. God does not forget us, will never let our babies down and for this reason, we have much to live for. Thank you for reading my story. Hugs to you and Sweetness! Nance, I am so thankful that you recovered from this terrible miscarriage it must have been so traumatic for you...just no words to describe what anguish you must have gone through...I am so sorry you suffered like this...you have been given an especially heavy load to carry...it is evidence that you are much loved, and that your mission here is very important. You were not supposed to leave this earth though, it was not your time and as you say, your perceptions of life and meaning, changed so dramatically because of coming so close with the brush of death...you are a strong woman, you have the will to prevail, to conquer in any situation because you have right on your side, never forget that, Nance. Your heart is immovably in the right place, in every situation - this is the person you are, no one can ever take this gift away from you. He has decided this course of action against you and I know that Bedo is going to help you be strong, and Buddy too. Please always think of our boys as right by your side through this, they will never abandon you during this struggle for your justice, for what is right. It may be a trap, to feel sorry for this man, because of your past and what is deep inside your head about him, but please do not forget what he is doing in the present, this is where life must be lived and sometimes it is a trap, to feel sorry for a person especially when they do not have your best interests at heart. You have to ask yourself that question, Nance - where does he really stand and is he now working against you? The devils are not going to win - you and Bedo are. Hugs to you and my sweet little B! Oh I am sorry I thought Jolee as Josee, I did not mispell her name as I know this is very disrespectful..sorry! Hugs to you, your sweet family including Sweetness! You are welcome, but please do not think that you do not express yourself well, or that I express things somehow better in some way...everyone just has their own voice, and our words just come together differently, that's all. Please know that you express yourself very well! I am so glad, that you recognize your heart's goodness and truth. This knowledge will keep you strong, in the face of any and all adversity. Like you, I am also a very sentimental person and yes, the past is always mixed in with the present...as you say, the core values carry through, and are timeless. Please do not feel you have shown any disrespect, for missing the spell of Joelee's name...it is unusual, and it is a bit of a 'made up' name...taken after her dad's first name, Joel. Hope that you have had a better day today...tomorrow is Buddy's 3 month Bridge Day, and the same date, too...the 15th and a Sunday. Mom is lonely for Buddy, heartbroken and still full of regrets about his diet that probably caused his early kidney failure ultimately...I don't know how to live with myself, truly...it is like running into a brick wall, with nowhere to go. You are so right - we do yearn for happier days, before all of this sadness and tragedy took our babies away...we try to be strong, but as you say, some days are better than others. Elise, I know tomorrow will be hard for you - 3 months of missing your precious Buddy. I really feel for you - the worst anniversary for me so far was when the date and the day were the same - it was a very hard time. I will be thinking of you. I'm wishing you pleasant dreams of you and your Buds. Your in my thoughts Elise. Honey, mom is sharing the three pictures Christian took on that last weekend - the last pictures of you and mom - remember honey, Pauline and Christian came to visit the weekend after Labor Day, when they knew you were sick? It was the last pictures of you, and of you and mom together...mom didn't know this at the time, but that's how it worked out, and mom only wishes it had been a better picture of us together, with you looking at the camera. Mom knows you didn't feel well that day, but still, you rose to the occasion for their visit, once again making mommy so proud of you. Mom wishes we had many more pictures together, but we don't have too many, do we baby? Because mom was usually the one taking the pictures and movies...oh well...we will have to take more, the next time we see each other baby, won't that be the best??! Mom will never forget Buds, how you could hardly wait for Christian to park the truck that day...you could hardly wait to go and greet them, even though you didn't feel well...you always loved your special pals who came to visit so much, and they always lifted your spirits as much as you lifted theirs! Baby, remember when Dave would come over or John, and you would give them such big hugs and let them know how happy you were to see them??! Well, Christian got you playing just like your old self that day...remember how he had your favorite cheesy treats and was hiding them from you, and you were trying to get them from him in the front yard? He loved to tease you a little bit, didn't he baby? He grew to love you so much, Bud Bud, and why wouldn't he? Mom will never forget that game that day, baby...and also, how he was trying to get you to eat your food on the back steps, by "hiding" the cheesy treats in your bowl? Well, it worked! Hugs, kisses and blessings to you honey, and to all of your angel pals at the Bridge today...please have fun and all you kids, remember your moms and dads down here!! Look at that face, that Golden Genuine face, how can I not fall in love with you? Sweet Nephew, you are in for a real treat tonight, for some reason, your aunt took out an organic chicken this morning before going to the office. Organic Chicken is Beed's favourite too, you will share with him as it is your big day, all the foods are meant for you Baby, by looking at you, A just fall so hard for that face, A face that would not even hurt a fly, so is your sweetmom, you are such a genuine pair together...I know mom misses you a lots and she is trying to manage her pain from the countkless sweet memories you had have shared...A wish you a happy 3rd month bridge day, A knows you will be surrounded with Angels of your size, Like Marsh, Lee Lee, Chances, sweet Kitties, such as Patches, Ally and all shorties such as your Loyal Assistant, Little B and his AA Girls, Dallas, Koji, Max and many Many More...A knows you will be celebrate your day with lots fun and love up there, you kids are singing and flying with your angel wings in the meadows...A is sending you lots of earthy love to you Sweet Boy, and of course, some homemade meals tonight too, A may cooks some of the Wild Salmon too, it is about time; it may sounds like crazy but A just need to do this for You so Enjoy them! In A's culture, we believe that you will be able to have them so Just Be Chinese for One day boy, Beed has already tought you how to use chopsticks! Baby, You were so lucky in the way that Mom had provided you with an advantuous life styles...you had have done so many interesting things and where mom lives is so cool, in a place with roomy vast land, parks, and lakes for you to enjoy...I am sure you are very very content with your earth life...Mom had made you lived your earth life to the fullest extent...so please tell mom not to think about the silly homecook meals any more...you may have had too much from your ly aunt by now...A can see the loving bond of you and mom, you are so much like a two legged in your fur suit, so loving, so sweet...Sweet Nephew, please send all sweet soothing signs to sooth mom's soul, she needs you more than ever before. Thank you mom for sharing such beautiful pictures of you two, looking at them just make A's day! what a perfect mother and son relationship to be treasure forever! Have a Blast up there Sweet Boy! Lots of hugs and kisses to you on your Big Day! You're welcome - sometimes it is hard to believe that so many years have passed since that fateful Easter Sunday - some of the memories are as clear as if it had just happened yesterday. But it does warm my heart, that some of what I share is of help to you, thank you for your wonderful compliment. Like you, I cannot fathom or understand the full or complete meaning of our losses. If I were to guess, it may be that our babies had another mission, another 'rescue' to perform...God had new plans for them, and also it was 'their time' to be together in the heavenly realm. The second guess would be, that for my life, God wanted Buddy to lead mom here, to try and help people suffering with the loss of their beloved babies, and to learn more about this part of life. Maybe it was our time to meet, here in this 'alternate universe'. Maybe Buddy knew it was time again, for mom to have a hard lesson or two, about priorities in life, and to never forget what is truly important. To never forget the lesson that life is precious, beyond words...that we can never take our loved ones for granted. You mentioned awhile ago, if you could go back to those moments with Lee Lee, you would have treasured them while they were happening, that much more intensely. Maybe this is how we are supposed to be, in all of our God given moments, from this day forward. Thank you for thinking of me and Buds this day, Melanie, and also for sending hugs our way - we appreciate and treasure you and Lee Lee so very much! Your sweet letter to your baby is so poignant - my heart breaks for you. I loved reading about him burrowing in the snowbanks for hidden treats and hearing how very much he was loved by all who knew him - such a precious memories for you. Your photos of him that day must mean so much to you - he is just such a special boy - I can't wait to meet him one day and give him a great big hug. Happy Three Month Bridge Day Angel Buddy! I know your party was a blast with all your friends, lots of games, treats and that wonderful Chinese meal - what a day! I wonder what pretty Lee Lee brought you today....there is no telling about my girl. Kisses and hugs for you sweet boy... You are so very loved and missed - try to visit with your Mom and send her a special sign to make her smile. I think Buddy will be writing you sometime soon, to let you know all about his party, and to thank you for being such a great Aunt! Big hugs from snowy Ontario, to you and your furbabies who you take such good care of, all the time! Melanie, you are so right when you say that you are not sure you will ever understand why our babies had to leave us, while still relatively young in earth years and as you say, if this is a test it is the most difficult one we will ever face...I cannot imagine a tougher test. My heart is with you at this 3 month anniversary. I know how hard it is. Buddy will live in your heart and be forever at your side. He is with people that love you and have passed. They are taking care of him and loving him until you join them. Its a hard road we are on, this grief but we will be better for it. I just loved your pictures of you and Buds. You can clearly see how much he loved his Mommy. I wish I had a last picture of me and my Patches.... I don't even know which one it would be. I shall look forward to Buddy's special hug that you described so perfectly... right after you get the million or so he is saving for his dear Mom. Our babies greetings are the most special of all - they are always so glad to see us whether we were apart for only a few minutes or for what seems like forever - like now. And thank you Elise for that thought of Lee Lee gathering pretties for everyone - I'll bet she has baskets and baskets of them - she'll be so proud to show them off. Thank you, I do treasure these last photos, and did not know that they would be our last at the time they were taken. Buds still had some life left in him at that point, and mom still had some hope for his recovery or at least that his condition could be managed, for awhile. He did love the snow so much - he loved both winter and summer, for different reasons. It is hard not having him here, as I would be active with him outside and during the winter, he could be off leash most of the time, especially the new home in Canada on the private road. It is so true, how our babies just loved greeting us, regardless of the time apart. I just love how in the moment they are...even if we were apart for a few hours, all was well again, the moment we walked through that door. 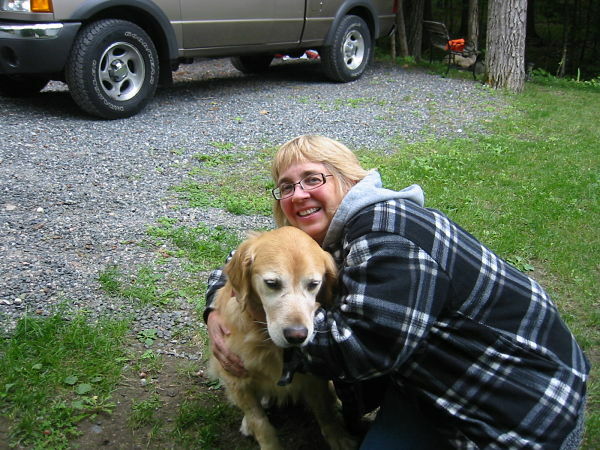 I can remember, after grocery shopping or running errands, coming home and the happiest thought in my head was seeing Buddy again...knowing he would be so happy to see mom, and that his sweet hugs were waiting! You have blessed mom's heart so much, this morning! We have not been in a dream together...just once, since you went away to the Bridge, but you knew mom needed to see you, to touch you and you have come through for mom, this day! December 17th, 2013...a day that held a sweet dream with my big Bubbly Boy, a day mom will never forget! You were so happy, honey, in this dream...and it was all so real, so true for both of us. Mom had gotten up earlier and come to here to write...you knew mom's heart has been so heavy these last few days...all the regrets, the guilt...the anguish of missing you not being here with mom, especially during Christmas time. You knew mom was in despair Sunday and yesterday...how hard it was for mom to come to Gram's without you, baby. Thank you for comming to mom's dream when she needs you the most, it was so sweet and thoughtful of you and it shows how much you love mom! Baby, when we love some one so deep to the point that has reached the spiritual level, there is always a connection,no matter what we are, when we believe, we will find peace. A knows that you always very much your oldself and mom's dream has proven that! A is so happy for mom and that is the best Christmas gift ever! Your poor mom has been suffering so much for missing you and your visit was a sooth to her soul! A looks at the pictures of you and mom, they show such a connection, you were just like a two legged boy trying to get more attention from your mom, A knows Forever, you two are just like that! Hugs and love to your sweet mom and you Sweet Boy! What a wonderful dream. Your prayers were answered and Buddy came to see you. Tiny miracles happen every day.They are there, watching us grieve and when they can our babies send us comfort. I'm so happy for you. Your dream is just awesome and you remember it is such vivid detail - what a blessing for you! I'm so glad that you recorded it here so that we could all feel the warmth a sweet visit can bring to a Mom that is missing her baby. I am happy for you beyond words. Way to go Buddy!!! I know you Mom would say "Keep 'em coming". We have been decorating for Christmas up here - you could only imagine the size of our Tree! We love our arts and crafts, and each of us angel babies is making a special ornament for our Tree. Can you keep a secret, Auntie? All of our ornaments have special meanings, and we make them from our deepest feelings of love and wisdom. We make them especially for our sweet moms and dads, and they contain all of the special memories from our Earth's life...so please don't worry if you temporarily forget something that you did with Bedo before, because he has placed that cherished memory in his special ornament that he will give to you, when you come! And you will be able to experience all of your memories again, when you hold his ornament that he made especially for you, in your sweet hands. Each ornament we are making is very unique, I took my half of me and mom's heart shaped cookie with me, when I came to RB, and now, my half is inside the ornament that I am making, especially for mom! When you moms and dads come, you can also make special ornaments for us babies, and I know my mom is bringing the other half of our heart shaped cookie and will place that half inside her ornament, too. Our tree is so beautiful, but you see, it is not complete just yet...it could never be complete until our ornaments are placed next to the ones that our moms and dads will make for us...so there is still much room on our tree for more artistic treasures! So yes, I am my old self, and all of us kids, too...we are just as we always were now that we are in heaven...please never forget our angel wings are around you forever, we love our earth parents so much! Thank you sweet A, you have such a huge warm heart...big hugs to you and my earthly cousins! Yes, it was a heart warming comforting dream, and one of many hopefully. I will try to remember your thought, that "tiny miracles happen every day". I think the biggest miracle for me, was Buddy coming into my life when he did. Although I had only six years with him, it was still our lifetime together...we could always wish for more, and yet any amount of time would never be enough. I would love to know about the comforts your sweet Marley has sent you...it is so precious how they still want to connect and be close, just as they always did. Thank you - yes, you are right, mom would definitely encourage her boy to "keep'em coming!" The best part of the dream was when I saw him in this very room, where I am writing this right now...on the floor and looking up at me, as if to say "Well...where's my hug?" It truly was a gift, to be feeling him in my arms again in this dream, so close once again. I miss our hugs, so very very much. It was always the highlight of my day (several times a day, to be sure) to give and receive hugs and lovey from my sweet boy...I know you can relate 100%. I wish a similar dream and blessing for you, and for all of the hurting parents here, who are missing their babies so much. I wanted to write it down right away, so as not to forget any part of it. I love hearing stories of our babies' visits, ways that they find to connect with us and their signs, letting us know they are always close. As one person mentioned in another thread, "little miracles happen every day". Buddy boy, you have mom's WHOLE love that is all it matters...when you receive something from someone, it has to come from the heart otherwise, it is meaningless, no matter what is given..We are too proud to beg..A thinks for sure my Nephew was proud and brave that's why you did not want any complication for mom...in earth life, nothing is perfect and sometimes we just have to settle for less in order to survive....it is such a complication. A is at peace to be able to control A's life as the way it is...no complication...Sweet Nephew, this morning A saw a block of birds playing right in the middle of the road...it was early so no cars were passing by..they were so comfortable that A wonder if they realy care if cars were comming...all differnt kinds of birds, in different color and shapes...there where a few kept flying and forming a circle around A's head like they were performing. It was such an intersting scene...it made A thinking of you, My SWEET B BOYS, AA GIRLS, Lee Lees, Max, Patches, Ellie and all of our sweet Angels...yes A does believe in sweet spirit, the physical form is just a cover for our earthy existance, that's why people say beauty is only skin deep...A knows for sure that you babies are around and A is so happy that you had visited mom...You are A's sweet Nephew and everytime A pays tribute to Bedo, A would mention you, A wants you to have what Beed has and A sure that your sweet mom feels the same way...she is living a challenging life now boy, please be a Hao Sun Chay other wise, will as little B to knock you on the head...and you tell him the same thing as we moms love you too much....Chrismas is comming A knows you guys are singing jingle bell up there...A wants all of you kids to be in harmony, to be happy and take care of one another just like our moms and dads here...life is not too ideal down here but with love, A sure things will be better having all the beautiful memories of you sweet angels wraped tightly in our hearts! Hugs to you Sweetie Hao Sun Chay and lots of love to you, Shortie B and all of our Angels! Hugs to your Sweet Mom and wish her a peaceful holidays! Was just wanting you to know that I was thinking about you and your adorable Buds this Sunday. A very warm sunny Sunday here in California. I'd like to think all of our babies are laying warm happy and safe together. Hope you are having a peaceful day today Elise, best as you can. I went to church tonight, to pray for all of us to make it through the holidays, pray for our babies, lighting a candle in honor of our sweet babies and for our aching hearts to find peace and solace. I know what you mean so much, that Christmas was such a joyous time with our babies, and now the 'magic' has gone, as our babies have taken it to the Bridge with them. The one thing that keeps me going is the knowing, that they are having the best Christmas ever...your baby is going to be receiving some mighty fine pretties tomorrow, and she will be saving the most special for her Mama, who she knows loves her endlessly. I know what you mean, when you say your feelings are way beyond "missing" Lee Lee, that it is this intense craving and longing for her. Sometimes, I catch myself in thought, "feeling" a sweet hug from Buddy...how he would burrow his head into my chest and make his sweet little emotional sounds...I can't think for too long about it, because it just hurts so much not having him here. He would sometimes take me a little off balance with his burrowing...it was like he just could not get close enough! It was the sweetest thing...and then, just being able to drop down on the floor at any moment, or when he was on his favorite spot on the couch and just going over to hug him and pet him...look into his beautiful eyes...yes, it goes far beyond 'missing'...it is a profound longing and craving for that physical connection with our babies...their sweet presence we could always always depend upon. Honestly, I don't know how we have even come this far...without our faith, and again, our knowing that they are in the most blessed place they could possibly be, with their friends and never lonely.